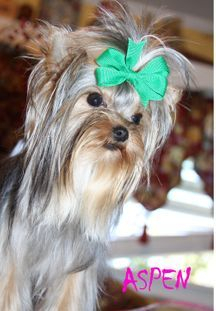 Welcome to Wild West Yorkies owned and operated by Carrie Gingery. My goal is to raise top quality AKC Yorkshire Terriers. I breed standard size 4-7 pounds with an occasional smaller one. I DO NOT SELL TO BREEDERS (I do however offer exceptions to show potential homes, and on a very slim occassion a hobby breeder). I do not give breeding rights. My puppies are for show or forever homes only. http://txyorkie.com/ Click on this link to see our other web page and more pics and information about us and our babies~ Carrie 940-704-9984 Please just shoot me a text. CAUTION: OUR YORKIES CAN'T HOLD THEIR LICKER!!!! !